This year I am running a special on a child's sterling silver florentine engraved bangle. This bangle fits up to a 5 3/4 inch wrist. Weighs 4.80 grams. It is 5mm wide and solid. The bangle has a polished finsh. 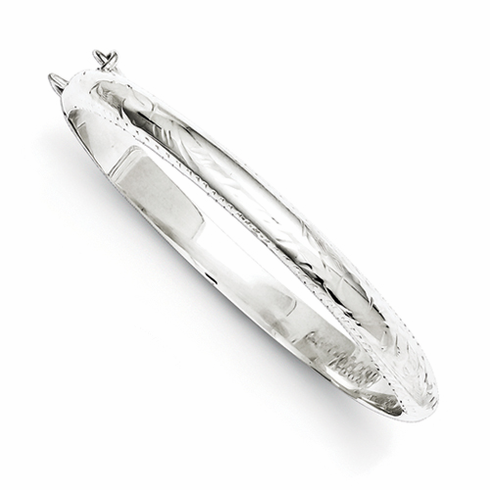 It is crafted from pure sterling silver. Makes a great gift for a little girl. Sterling is 92.5% silver alloyed (base metal) with 7.5% copper. Sterling was adapted as a standard alloy in England in the twelfth century when King Henry II imported refiners from an area of Germany known as the Easterling. The product they made was of a consistent quality and came into usage as currency by 1300 when it was known as Easterling silver. While sterling silver today contains 92.5% or better pure silver, the base metal in the alloy can still vary widely. The most valuable base metal for jewelry is copper, and the alloys of .925 silver/.075 copper are often referred to as Italian Sterling Silver. Mexican silver and sterling silver generally has a large quantity of lead used as the base metal. All of our Sterling Silver Jewelry is made of Italian Sterling Silver.